Bonita Fairways is a 3400-yard, par 61, 18 hole executive golf course designed by Gordon Lewis. It is a Bonita Springs Golf course that and is located on West Terry Street in Bonita Springs, Florida. The course is semi-private and currently open to the public. This course challenges your short game as well as your long game. There are seven par 4's; the remainder are par 3's. The front nine feature hills and valleys, sand traps, and several small waterholes. The back nine keep you on your toes with larger waterholes, sand traps, and doglegs--all surrounded by a pristine nature preserve. After play wind down at The Gator Hole Pub & Grill for a great lunch, cold drinks, or just a little friendly conversation and bragging. Bonita Fairways hosts a 19,000-square-foot clubhouse. This two-story structure features a fitness room, library, commercial kitchen, card room, billiards and poker table, stage, meeting rooms, and the banquet room, overlooking lake and fountain. The golf membership is optional for home owners. Bonita Fairways is not a bundled golf community. Other amenities of Bonita Fairways include lighted tennis and shuffleboard courts, a lushly-landscaped pool and whirlpool spa, the putting green, driving range, and a public, 18-hole executive golf course designed by Gordon Lewis. Bermuda Links currently offers both new and resale properties. Pricing starts just under $200,000 and condominiums have a minimum two bedroom. The condominium buildings are two story. Bermuda Links has a sister community a few miles away named Bermuda Park of Bonita Springs. The same floor plans are available in a non-golf style community. 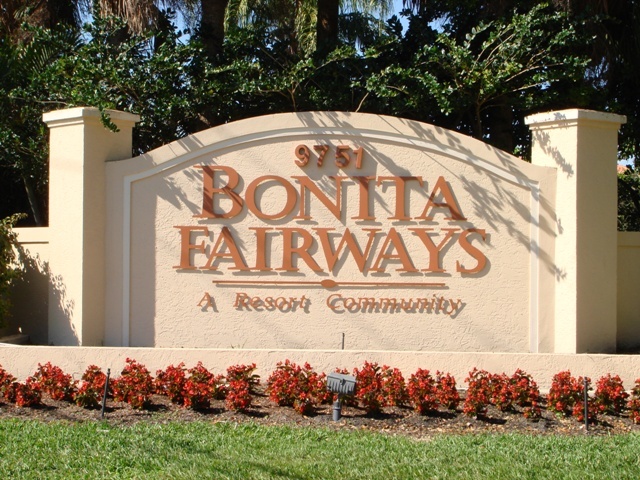 Bonita Fairways is located just minutes to the white sugar sand beaches of Bonita Beach and Coconut Point Mall and only 20-25 minutes to SW Florida International Airport, FGCU - Florida Gulfcoast University. Gardens At Bermuda Links Bldg.